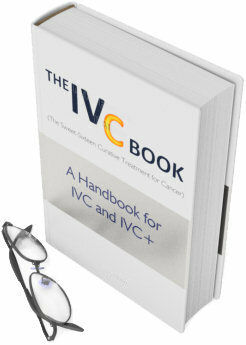 Chapter 1: What Is IVC? What is IVC+? Not Your Grandma’s “Vitamin C”, Not Even Close! So Then … What Is IVC? To Cocktail or Not to Cocktail? Not. Cancer Treatments Abound, So What Makes IVC Stand Out? In the search for a “Cure-all” why have we neglected a “Care-all”? True Care = QOL. QOL = True Care. How Powerful Is Your Cancer-Fighting Engine, Really? IVC is Not Necessary Because It’s an Early Stage, or They are Easily Treated? Skip IVC Because “There’s No Time to Waste”? Blocks chemo or radiation effectiveness? Proven Ineffective In The Extremely Underdosed 1980’s Mayo Clinic Trials? They supposedly tested IVC … without using IVC! …Three times! Incorrect readings on glucose strips and glucometers up to 8 hrs (gives false positives). The 24hr Intra-Operative Awareness Side-Effect. Important! NOTE: Patients should be advised that certain anti-cancer “enhancements” might not be compatible with IVC administration. Diet Guidelines: Low Carbs, Slow Carbs, and Veggies, Yum! What’s the Best Kind of Vitamin C for Megadosing? Exotic Forms containing DHAA (Oxidized C)? What time of day to take vitamin C, avoiding stomach discomfort and diarrhea? A Worthy Replacement for IVC? Is There a Silver Bullet IVC+ Protocol? Intravenous AA vs Intravenous DHAA, How Important Is It? Are We Doing IVC Long Enough After Supposed Remission?